The reception of the Eucharist has been and will ever continue to be vital to Catholics as the food that sustains them. Early in the Church’s life, it became necessary to reserve some portion of the Eucharist so that those who were ill or in prison for their faith, could also share in the family meal of Christians. In our Church, a special area is set aside for storing consecrated hosts and that is the Eucharistic Shrine. 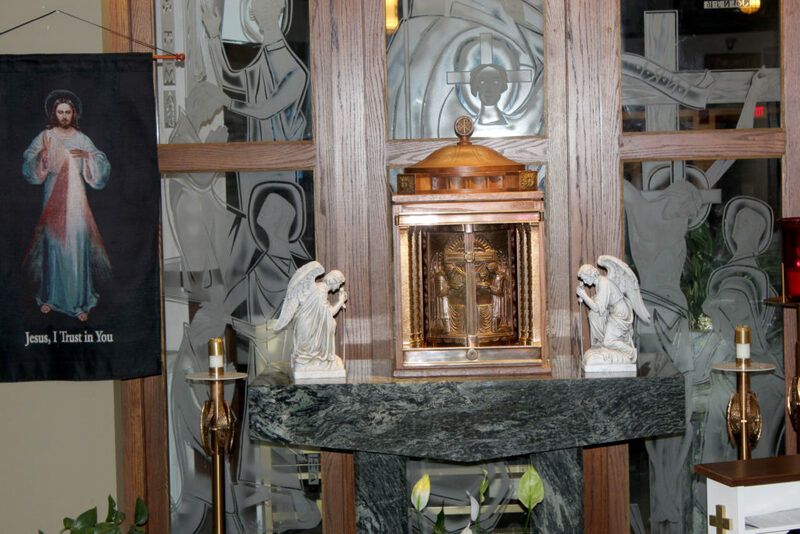 The tabernacle is used for the reservation of the Sacrament of the Lord’s body – the consecrated host. Since the Church believes that Christ is truly present in the Eucharist, this receptacle is a permanent recognizable fixture. As a mark of honor and respect to the Divine Presence in the Blessed Sacrament, a candle is found burning before the Tabernacle. The tabernacle lamp is on a lamp stand at the far right of this photograph. The Book of Prayer is intended to receive and hold the prayers and intentions of any and all that come to pray in St. Patrick Church. Because the public prayer of the Church is bound to the many prayers of those who make up the Church, we add these prayer intentions to our intercessions at all weekend liturgies. 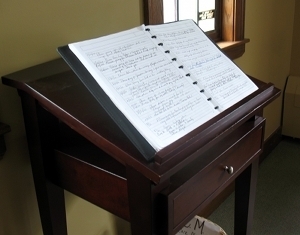 The Book of Prayer is located in the Eucharistic Chapel. Please click here to continue the tour.